You are here: REDWOLF > Home > News >News Detail - G&G UMG In Stock! 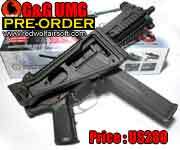 Long awaited by airsoft fans around the world, the UMP (or UMG as G&G calls its airsoft version) is a big movie gun - in that it appears to be the firearm of choice by movie directors in recent years. Think back to the evil twins from Matrix Reloaded (2003) as one of them empties a UMP towards the fleeting motorcycle (piloted by Trinity) from atop their SUV, or Will Smith in Bad Boys II (2003) as he swings out his UMP from his skidding Ferrari, or more recently Angelina Jolie in Mr. & Mrs. Smith when she tries to kill her husband Brad Pitt in the kitchen shoot-out scene. It's really no wonder that the UMP has therefore become one of the most sought-after styles in airsoft as well! After years in development and many months in pre-production testing, G&G's UMG has finally arrived! This new AEG sports many great features that outpace typical AEGs from established companies like Marui. 1. Realistic cocking lever with locking chamber cover for adjusting metal hopup function. 2. Sturdy nylon reinforced folding stock (UMG length from 452mm to 695mm) suitable for CQB situation, with soft rubber finishing for comfortable use. 3. Two side 20mm rails, one lower 20mm rail and top 20mm rail for attaching accessories such as scope, flashlight and laser. 4. CNC one-piece rigid outer barrel. 5. Smart space design for holding stick stick battery, easy to install battery. 6. Constructed with nlyon and metal in much the same manner as the real thing.